Certified ICG Member, ICG Asia VP and ICG 2015 Worldwide Clubmaker of the Year Eric Ng and ICG member Atiq Adris featured on the Golf Channel (Thailand). Eric writes: "The Idea of 3D fitting was inspired by an institution, a shaft manufacturer and an individual. I had a rare chance to visit Mitsubishi Rayon plant in Toyohashi and they had a driver fitting system which created by the University of Tokyo. It took them 5 years to developed the fitting programme. Investing in the KVest, Boditrak and FlightScope allows us to collect data to provide better clarity of each golfer in reaction to different shafts – weights, flexes and characteristics. In some of my conversation with ICG Hall of Fame winner, Jerry Hoefling, I learnt the importance of shaft profile with regards to the swing profile of a golfer. From takeaway, transition to downswing, the shaft profile is an invisible but important element in optimising a golf club. This was also the basis of a 9 shaft fitting system which we are producing with a shaft manufacturer. Basically a golfer can swing 9 different shafts and we can zero in on whats appropriate and what's not. 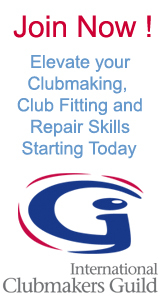 Last but not least, the International Clubmakers Guild. Having the Guild as my guiding star and foundation to explore. This push me to think beyond whats in the textbook. I hope to share the experience when we make further progress so that all our members can benefit from different perspectives." Video with Eric starts at the 1 minute mark (Interview is in English with Thai sub-titles). Atiq discusses how ICG Sponsor Big Fish does club fitting. Interview questions are in both Thai and English, answers in English).